With the World Sportscar Championship concluded, and a fifth place finish in the books, Sauber and Mercedes were busy working on the next race car to enter the 1987 season. In a shot that came way out of left field, they named it the C9. This C9 is the car of which I care to focus on in greater detail. Like the majority of the C series cars before it, the C9 acts as a culmination of the engineering and development work that went into all of the cars. Peter Sauber and Mercedes Benz put forth the best they had to offer and combined it into a car that would prove to be immensely successful. I had the pleasure of being able to hack around with the C9 in several of the Gran Turismo games, hence your reading of it here. Personally, I always thought this car to be extremely intimidating. The thick, solid looking body devoid of any flashy livery was a different look than the 962s and XJR-9’s with their flaired rear wheel arches (that feature in particular never looked right to my eye). But who cares what I think about the C9. It was objectively brilliant, and you’ll find out why. A further development of its predecessor, the C9 returned to the World Championship for Sports Prototypes with brand new suspension and body. The engine was once again a Heini Mader creation chucking out a peak 720 horsepower, all bolted to an aluminum monocoque with steel rear sub-frame. Kouros Racing wrapped up the cars in their signature dark blue team livery, and amassed a whopping 4 season points… But you already knew this. If your team name didn’t have Jaguar in it, 1987 was not the time to be a Group C competitor. The Porsche 962’s were only able to consider themselves as competitors out of sheer field volume. Le Mans was the only half respectable qualifying effort put forth by the Sauber machines, with 7th and 8th rankings. Inside of midnight on opening day, both cars had been retired due to drivetrain issues. Forget 1987 then if were talking Sauber C9, and move to 1988. Kouros, out. Mercedes, in. Factory backing was the new way forward for the Sauber team. Surprisingly undeterred by the poor performance of the new platform, Mercedes went full force in its support of the C9 marking the first factory supported Mercedes racing team in 33 years, and it wasn’t long before the move paid dividends. The first race of the season was held at Circuito Permanente de Jerez over a span of 800km. The C9 won. The next three races however were spent chasing the Silk Cut Jaguars, albeit competitively. 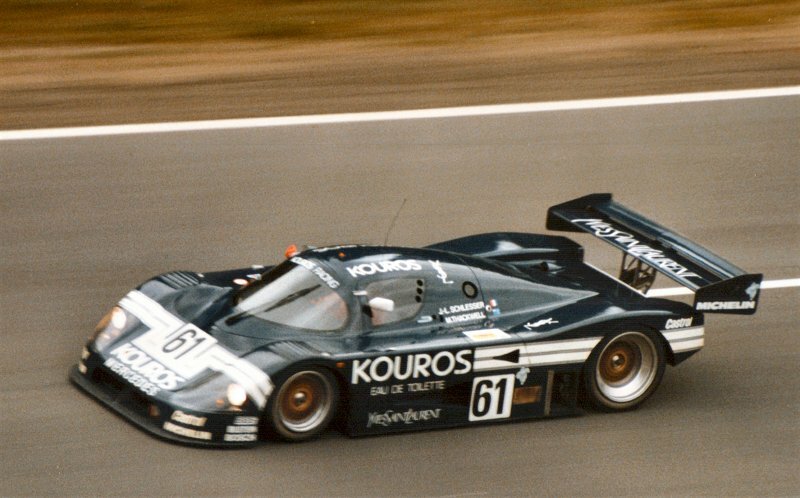 Le Mans of 1988 however was a particularly embarrassing showing for the Sauber Mercedes camp. The top speeds and extremely high downforce was putting an immense load on the Michelin tires, so much so that one of the rears burst at speed during the qualifying session. At this point, the team made a decision to withdraw from the race entirely, deeming it too dangerous to compete and risk another high speed incident. They were the only team in the field to make such a decision. After watching the Jaguar run away with the championship over those 24 hours, Sauber Mercedes quickly turned around to take the next race at Brno, and three more victories through the remainder of the season. The damage was already done in the championship however as Jaguar was too consistent following their string of victories in the first half of the season. Sauber Mercedes had earned 2nd place in the championship for teams, and a foundation of success on which to develop their 1989 effort. The M119 engine was a newly developed engine platform put forth by Mercedes Benz to be fitted into some of their larger luxury vehicles like the SL, SEL and SEC. Available in three displacements (4.2, 5.0 and 6.0L) the engine boasted a number of improvements over its M117 predecessor, most notable of which was a 4 valve dual overhead camshaft (DOHC) configuration. To complete another sporadically placed engineering lesson throughout this work, the DOHC system provides a number of benefits over a SOHC layout. As the name implies, it means there are two cam shafts per bank of cylinders, to operate two intake valves, and two exhaust valves per cylinder. More valves means more openings for air to enter the combustion chamber which allows the potential to create more power. The 5.0L M119 block was used for the 1989 C9 car. However, the engine’s plebian 322 horsepower wasn’t going to cut it for Sauber Mercedes, so of course two turbochargers were added along with some higher strength internals to dial up the peak output to 720 horsepower. Other changes to the team included livery, in which AEG was demoted from a principle sponsor to a minor one with a few small logos emblazoned on a now completely silver body. The silver arrow was back in a big way. Much like putting your entire nest egg into Apple Inc. approaching 2005, Mercedes couldn’t have chosen to show their unified factory support for the Sauber Mercedes team at a better time than going into the 1989 season. In short, the C9 was nearly untouchable. All but one race in the season was claimed by Sauber Mercedes.